The Archbishops of Armagh and Dr Emer Crooke with the wreath of peace at the Menin Gate, Ypres. The cross–community pilgrimage of hope, led by the Archbishops of Armagh, arrived at Messines on the morning of Friday, 1st June. On the previous evening, the pilgrims attended the Menin Gate Last Post ceremony which takes place nightly at 8pm and includes the laying of wreaths. 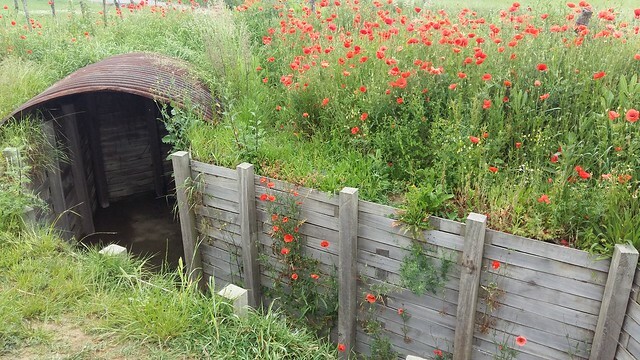 This has become part of the daily life in Ypres as a simple but moving tribute to the courage and self–sacrifice of those who fell in defence of their town. Archdeacon Andrew Forster identified the name of JJ Ormsby – a parishioner from his parish in Dungannon – among those commemorated on the Menin Gate. This visit to Messines allowed time for prayers and reflection at the Island of Ireland Peace Park. The park surrounds the Irish Peace Tower, a replica of an Irish round tower, and is a memorial to the huge number of soldiers of the island of Ireland participating in the First World War who died, were wounded or are missing. The tower memorial is close to the site of the Battle for the Messines Ridge, which took place in June 1917. Archbishop Richard Clarke reads a poem at a bunker on the Christmas truce site, at Messines. Archbishop Richard Clarke (Church of Ireland) and Archbishop Eamon Martin (Catholic Church) led reflections and all members of the group read the Peace Pledge. One of the pilgrims, Annette McGrath, visited an area where her grandfather, Jack Christie, helped wounded men as a stretcher bearer during his war service on the Western Front. Jack served at the Somme, Ypres and Messines, and returned to Belfast after the war. In later life, he went back to those former battlefields and was interviewed by the Somme Association as part of its oral testimony project. Visiting the Island of Ireland Peace Park. The group of pilgrims comprises 36 people of varying ages and backgrounds and representing the Protestant and Catholic traditions, including a core group of 16 young adults, who in visiting the war sites and memorials will be able to forge friendships and share their thoughts and hopes for the future while exploring their cultural identities. Their pilgrimage has also included visits to Kortrijk, a Belgian city which was heavily bombed in 1917, and the cemeteries and memorials at Thiepval and Guillemont along the former frontline in the Somme. The group will travel to Memorial Museum, at Passchendaele, and Tyne Cot Cemetery this afternoon before returning to Ireland. The Archbishops previously led a cross–community delegation of young people from across the island of Ireland to the battle sites of the Somme two years ago; the current pilgrimage marks the upcoming centenary of the end of the First World War.